"Caron trained our team for grammatical and writing skills. She was professional and engaged well with our team. I have also been impressed with Caron's corporate writing and would recommend her for this service as well." Indra Gardner, Founder/Chief Influence Officer at i.d.e.a. 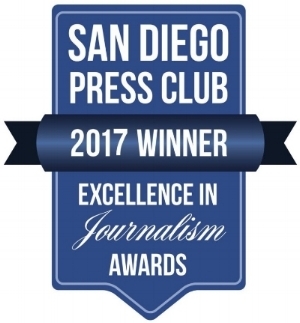 2017 San Diego Press Club Excellence in Journalism Awards for Food Writing, including First Place Websites: Blog-Topic Based for San Diego Foodstuff, First Place Online and Daily Newspapers -Food for my post on San Diego Foodstuff ("Mort's Favorites"), second place for Websites-Blog by Corporation or Group for the American Personal and Private Chef Association's blog à al minute, and third place for Magazines-Environment for a story for Edible San Diego ("Closing the Loop: A Zero-Waste Sustainability Business). And--I was awarded Best of Show--Best Website Entry--for San Diego Foodstuff. 2014 San Diego Press Club Excellence in Journalism Awards for Food Writing, including First Place for Magazines: Food & Restaurant for a story for Edible San Diego on Pt. Loma Farm ("The Little Farm That Could"), second place in the same category for another story for Edible San Diego on Konyn Dairy ("Last Man Standing"), second place in the category Magazines: Environment for an Edible San Diego story on food waste ("Trash Talking"), and second place in the category Daily Newspapers and Websites: Food & Restaurants for the first in a four-part series appearing in UT San Diego on eating well with diabetes (Diabetes Diagnosis Was Wake-Up Call"). 2013 San Diego Press Club Excellence in Journalism Awards For Food Writing, including First Place for Websites: Blog - Topic Based for a post in San Diego Foodstuff called "French Sorrel and Mint Granita" and Second Place for Magazines: Food & Restaurant for my piece "Local Gone Wild: The Foraged Meal" for Edible San Diego. 2011 San Diego Press Club Excellence in Journalism Awards for Food Writing, including First Place for Magazine: Education for a story for Edible San Diego, Second Place for Magazine: Food & Restaurant for another story for Edible San Diego, and First Place for Website: Blog – Feature Writing for my blog, San Diego Foodstuff. 2010 San Diego Press Club Excellence in Journalism Awards for Food Writing, including First and Second Places for Daily Newspapers and Websites: Food: Reviews or Coverage for stories on SDNN, First Place for Magazines: Food for a story in Edible San Diego, and First Place for Website: Topic-Based Blog for a post on San Diego Foodstuff on Knight Salumi.